This recording traverses Canada, America and the British isles in music that has helped define the culture of those nations. England is represented by two of its most celebrated composers, Holst and Vaughan Williams, and the iconic Scottish Auld Lang Syne is traditionally sung to greet each New Year. Celebrated Canadian songs include Jimmy Rankin’s Juno Award-winning Fare thee well love. Eric Whitacre’s distinctive harmonic clusters can be heard in Go lovely rose, and Gordon Lightfoot counts Bob Dylan among his many fans, Dylan once declaring that when he heard a song such as Pussywillows, cat-tails he wished ‘it would last forever’. Noel Edison admits that such an album tackling the extensive realm of folk song can only ever be “a brief snapshot of somte of the conductors’ favourite pieces.” His particular focus was to select mainly Canadian arrangements as the ensemble’s country had just celebrated its sesquicentennial anniversary. “There are a good number of Canadian songs here from coast to coast from local lore. England has a rich treasure trove of folk songs and I could not complete this compilation without including a few that I love. Finally, and maybe the odd choice, Billy Joel’s And so it goes”; an American classic has always touched the conductor personally. 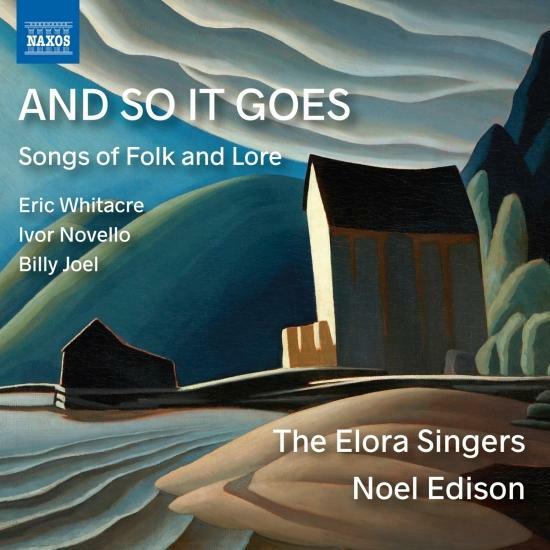 formerly known as the Elora Festival Singers, founded in 1980 by artistic director Noel Edison, is an all-professional GRAMMY®- and twice JUNO-nominated chamber choir known for its rich, warm sound and clarity of texture. This is achieved by holding annual auditions for current and aspiring choristers, which fosters and ensures the preservation and integrity of this trademark sound. The Elora Singers is also renowned for its commitment to Canadian repertoire and for its collaborations with other artists from across Canada and around the world. Through its regular concert series, recordings, broadcasts and touring, the Elora Singers is widely praised as one of the finest chamber choirs in Canada, contributing to the musical life of our local communities throughout the country as well as on the international stage. 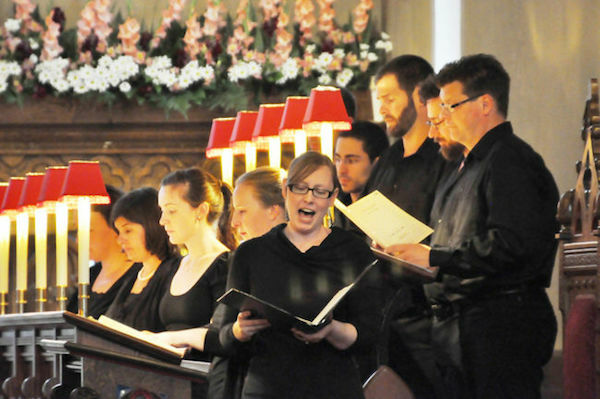 The choir is the principal choral ensemble of the Elora Festival and, since 1997, has been the professional core of the Toronto Mendelssohn Choir. is well established as one of the most versatile and charismatic conductors in the world today. As conductor and artistic director of two world-class Canadian ensembles, the large-scale Toronto Mendelssohn Choir (TMC) and the chamber-sized Elora Festival Singers, Mr. Edison is widely recognized and appreciated for his skillful interpretive blending of rigorous musical purity together with warm emotional content. In addition to full seasons with the TMC and the Elora Festival Singers, he is in demand for guest engagements with such orchestras as the Charlotte Symphony in North Carolina, the Winnipeg Symphony, Toronto Symphony and Symphony Nova Scotia. His recent recording on the Naxos label, featuring the choral music of Eric Whitacre, was nominated for a Grammy. A native of Toronto, Mr. Edison aspired from boyhood to pursue a vocation in music with a special emphasis on conducting. During his youth he received a disciplined choral education at St. Simon’s Church as a chorister in one of North America’s leading boys’ choirs. Further, a supportive family encouraged his efforts to organize and conduct his first choir, an all-girls chorus at Toronto’s downtown Jarvis Collegiate. Mr. Edison completed his formal education with a music degree at Wilfrid Laurier University (WLU) in Kitchener-Waterloo in 1985 and in 2002 was awarded an honorary Doctor of Music by the University of Guelph. As a singer and piano-organ player, Mr. Edison studied with a number of leading musicians including Victor Martins, Helmuth Rilling, Sir David Willcocks, Wayne Riddell and John Aldis as well as the late Ned Hanson and Robert Shaw. Mr. Edison’s greatest successes as conductor and musical impresario are linked strongly to the historic Ontario village of Elora. The Elora connection was forged in 1980 when Mr. Edison harnessed the resources of musically-inclined citizens and professors from nearby WLU to establish the Elora Festival, together with the Elora Festival Singers as the choir-in-residence. Every summer for three decades, the Elora Festival has attracted capacity crowds for three weeks of international vocal music, from large-scale classical works for choir and orchestra to intimate evenings of jazz and cabaret. For his artistic services to the Elora community, Mr. Edison received the Prime Minister’s Young Canadian Achiever’s Award in 1982. Since 1984, Mr. Edison has served both as Artistic Director of the Elora Festival as well as Organist and Choirmaster at the Church of St. John the Evangelist in Elora, one of the few all-professional church choirs in Canada. Mr. Edison’s formal association with the Toronto Mendelssohn Choir began in 1997, with the selection of his Elora Festival Singers as the professional core of the venerable Toronto institution. After serving two years as TMC Interim Conductor, Mr. Edison succeeded in winning one of Canada’s greatest musical prizes with his appointment as permanent Conductor in 1999. During his musical career, Mr. Edison has commissioned many new works from Canadian composers, including Eric Robertson, Gary Kulesha, John Beckwith, Srul Irving Glick, Timothy Sullivan, Glenn Buhr, and Imant Raminsh. In 1994, the Elora Festival’s production of Sullivan’s chamber opera, FLORENCE, THE LADY WITH THE LAMP (with libretto by Ann McPherson) won the Chalmers Award, Canada’s leading award for the performing arts. Mr. Edison tours regularly with the Elora Festival Singers and is a favourite in concerts with the Elora Festival Singers or the Toronto Mendelssohn Choir on the CBC. A frequent guest conductor of the Kitchener-Waterloo Symphony, Mr. Edison has twice performed the Berlioz REQUIEM, recording this work for the Naxos label during his inaugural season as TMC Conductor. Mr. Edison’s other recordings include Arvo Pärt’s Berliner Messe, Nine Lessons and Carols for Summer, Christmas in Elora, A Festival of Carols, A Celebration in Song, Willan: In the Heavenly Kingdom, Psalms for the Soul, Pärt – Music for Unaccompanied Choir and Songs of Folk and Love and most recently Requiems: Faure and Durufle and Eric Whitacre: Choral Music and selections from the choral works of Julian Wachner. Mr. Edison serves as a regular juror for the Canadian Broadcasting Corporation, the Ontario Arts Council, and the Juno Awards. In addition, he serves on the Board of Directors of the Association of Choral Conductors of Canada.